We are excited to announce the upcoming release of our upgraded content management system, Ed.it 2.0. 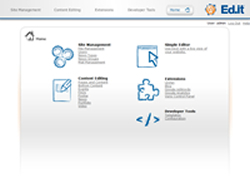 The CMS was originally built in 2004 to meet client needs for complete website customization and control. OffWhite is constantly developing new features for our CMS as technology and new media evolve, and Ed.it 2.0 combines all of the latest Ed.it 1.0 features with a new set of attributes. User permissions for specific tasks, such as News, Events, Products, Video, etc. Addition of an area to tie into third-party software, such as e-commerce, traffic tracking, ad banners, etc. Look for more about Ed.it 2.0 as we prepare for the software launch in October 2011. To schedule a demo, please contact us.